¡D.C. United está en fuego! Head over to Audi Field on Thursday, November 1st for the #4 D.C. United playoff tilt against #5 Columbus Crew. Loser goes home. Sorry Ohio, Thursday will not be your day. It’s not every season a last place team like D.C. United, which languished at the bottom of the standings mid-way through the MLS soccer campaign, can turn it on and be one of the best teams heading into the playoffs. It even happened twice in 2018, because the Seattle Sounders FC had an equally impressive turnaround in the Western Conference, including a record nine-game winning streak. D.C. United finished the second half of the season (over the last 17 games) very strong, gaining 37 points (11-4-2) to finish at 51 total points and qualifying for a home playoff game against all odds. The biggest reason? Well two. 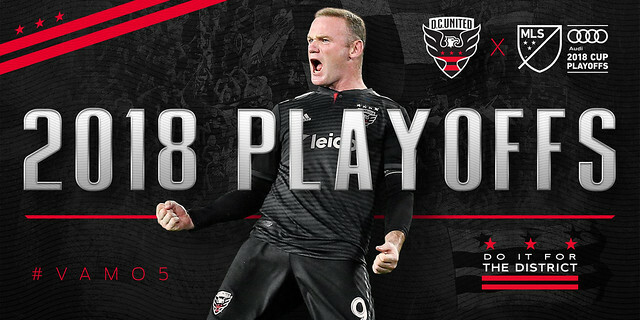 The addition of Wayne Rooney (and his 12 goals) and the new stadium, Audi Field, sparked a renewed excitement among fans. Bold Prediction: D.C. United wins 3-1. Bolder Prediction: D.C. United vs. Seattle Sounders FC in the MLS Cup. Tickets were $49+ (now more!). Game at Audi Field at 8pm.